Home→All-Bisque Dolls→Is Redressable a Word? 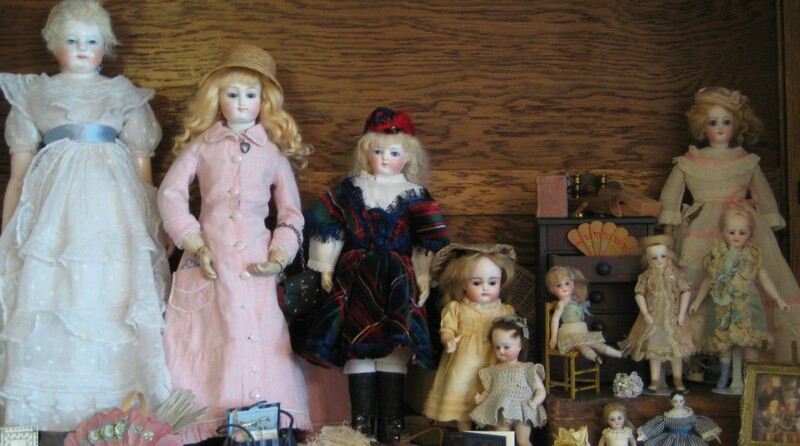 Many doll collectors search for the most pristine dolls in their original clothing. 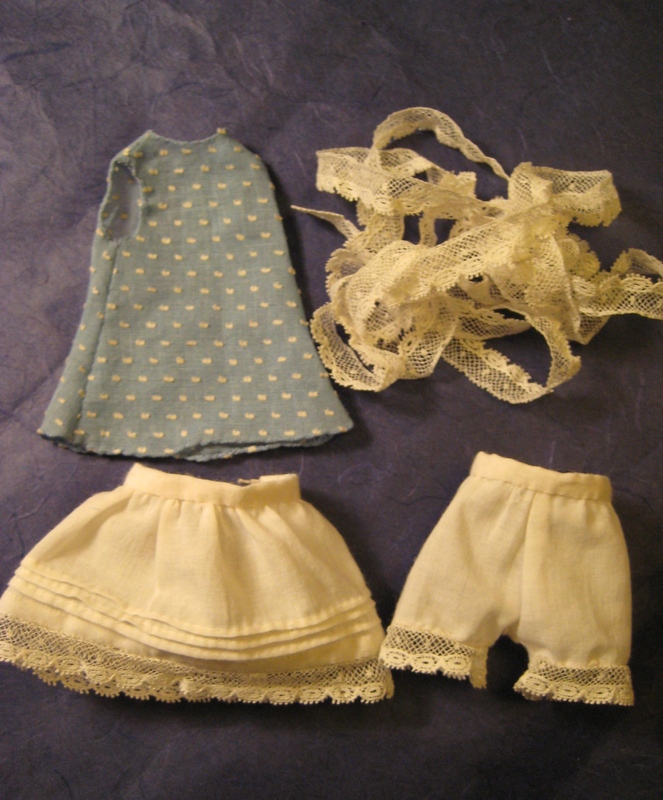 Doll collectors who love to sew for their dolls often prefer to collect undressed or redressable dolls. 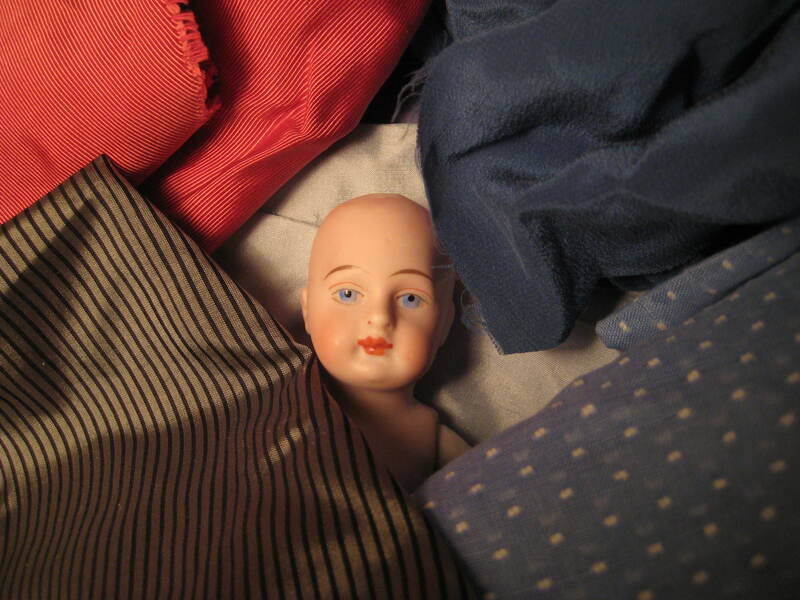 I sometimes feel guilty about redressing a doll that came to me in her original clothing. I do not like to feel guilty. Over the past few years, I have enjoyed purchasing naked or redressable all-bisque dolls and transforming them. This sweet 6 3/4” German all-bisque doll is my latest project. This shows her as she came to me. I believe that she was dressed and wigged in the 1980’s (I had that bad perm at some point in the 1980’s). Her dress was sewn on (not easily removable) and made from many yards of polyester ribbon and would have looked lovely at a prom. I purchased her from an on-line auction and was drawn to her lovely face painting and her wonderful shoes. It is always a gamble when purchasing a doll from an on-line dealer who really does not know about dolls. But this time my gamble paid off. The first thing I do when a new doll arrives is examine it for flaws and marks. I gently peel back the back edge of the wig and peek under the clothing to look for markings and flaws. Since I determined that her clothing and wig had to go, I was free to take her apart to really check her out. Under her dress, she wore a bright pink ribbon petticoat and pink drawers with nylon lace trim. She is marked “1 ½” on the back of her head, and inside her arms and legs. This means that all her parts belong together and that she was not assembled from random parts. Her leg openings are lined with kid. The painting on her face is beautifully done with painted blue eyes outlined with red on the lids. She has single-stroke brows that are level and matched (this doesn’t happen often). Full red lips, nose dots and rosy cheeks complete her look. Her body is unevenly painted; her left arm and right leg are lighter in color. This is not unusual, nor does it detract greatly from her value. I imagine that in early doll factories in Germany the person assembling the dolls chose from large bins of limbs and bodies that were cleaned and painted by different people. Limbs with matching marks are often unmatched in color and/or texture. The fingers of her left (paler) hand are more finely detailed than on her right. I love her shoes. They are painted golden yellow with black heels and dainty pale blue bows. Her painting is completed by long, black textured stockings. Her stringing was tight and in good shape, so I did not restring her. Glue from her wig was stuck to her head, so she got a headstand soak in water to remove it. If she had inserted-glass eyes, I would have had to try another method to remove the glue so as not to damage the eye mechanism or plaster. While she was soaking, I assembled my cleaning supplies. I use paper towels, cotton swabs, toothpicks, cotton balls, clear water, 409, and a small bowl to pour a bit of the 409 into. 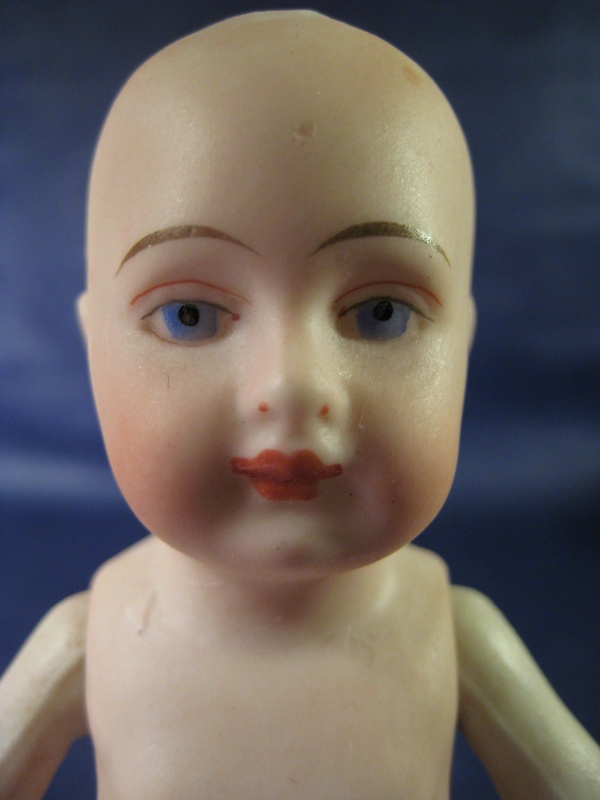 Mildred Seeley wrote in one of her books that she used Formula 409 to clean her doll’s bisque, so I use it, too. A doll may appear clean, but the dirty cotton swabs often prove otherwise. Now that she was clean, it was time to decide what she would wear. 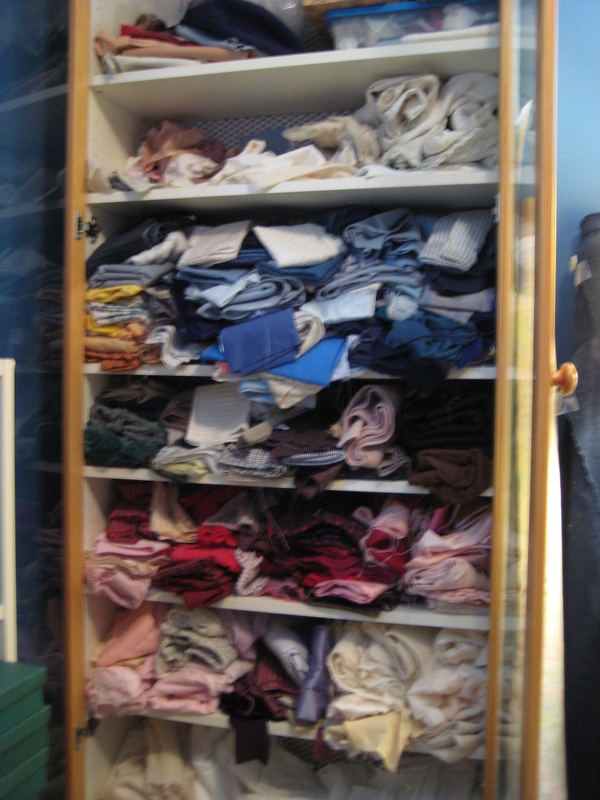 When choosing fabric for a doll’s clothing, I take the doll to my fabric stash so that I can find what works with her coloring. I choose several options and look at them in different lighting. The fabric choice must also be the right texture and weight for the style of costume she will have. I chose the vintage blue dotted swiss; it looks lovely with her eyes and I have a bit of an obsession with blue. It is a very fine fabric and the dots are spaced close together. Often the dots on dotted swiss fabric are spaced far apart and only a couple of them show on the doll’s dress, which looks weird. Doll costumers each have their own rules for what materials and styles they prefer. Some just want to make the doll look cute. I respect that. A lot of time and love went into this doll’s costume. Others are adamant about using only antique materials. My rules are somewhere in between and I’ll share them with you soon. So far, she has new underwear, a slip and the beginnings of a dress. When I do more, I’ll give you an update on how I sewed her costume, why I am obsessed with blue, and how to finish her transformation. Thank you for reading my blog and I welcome your comments and questions. If you like it, please subscribe.